In a rare mea culpa, N.F.L. Commissioner Roger Goodell said Thursday that he had mishandled the Ray Rice case, in which the Baltimore Ravens running back was suspended for two games after being accused of assaulting his fiancée. The suspension was announced late last month to an instant and furious uproar from women’s groups, organizations supporting victims of domestic violence and league players who felt the penalty was too light and inconsistent with punishments for other offenses. Goodell said that effective immediately any N.F.L. employee — not only a player — who is found to have engaged in assault, battery, domestic violence or sexual assault that involved physical force will be suspended without pay for six games for a first offense. Second-time offenders will be banished from the league for at least one year. The about-face by Goodell, the most powerful executive in American sports, was stunning in its earnestness and clarity. The commissioner wrote frequently in the first person and admitted that he had lost sight of not only the seriousness of domestic violence, but also the league’s role as a leader in the sports world. Coming a month after the suspension of Rice, Goodell’s decision appeared considered, not rushed. But it is also one of the few times during his eight-year tenure that Goodell has publicly admitted to making such a mistake. Since becoming commissioner in 2006, he has grappled with one crisis after another, from players using guns to spying by teams to bullying and the use of homophobic and racist language by players. He has rarely backpedaled on his decisions even in the face of withering criticism. Perhaps most significantly, Goodell has equivocated on the issue of concussions and their impact on the health of players. For years, Goodell and the league dismissed mounting evidence about the dangers of repeated head hits, including in front of members of Congress. The league has since changed rules and pledged tens of millions of dollars to study the impact of concussions, but the commissioner has never acknowledged the league’s past role in trying to sidestep the issue. That evasion may cost the league dearly. Frustration over the league’s stance is one reason nearly 5,000 retired players sued the N.F.L. and Riddell, a helmet manufacturer, for hiding from them the dangers of concussions. A federal judge has preliminarily approved a landmark 65-year settlement that would award millions of dollars to players with severe neurological disorders, and spend tens of millions more to monitor other players. Unlike concussions, which have an impact on the game and the finances of the N.F.L., the league’s stance on domestic violence is not purely a financial issue. While the league has spent years courting female fans by, among other things, having its players wear pink cleats to raise awareness of breast cancer, Goodell also announced his new policy a week before the start of the regular season and ahead of a three-day weekend, when many people are on vacation. 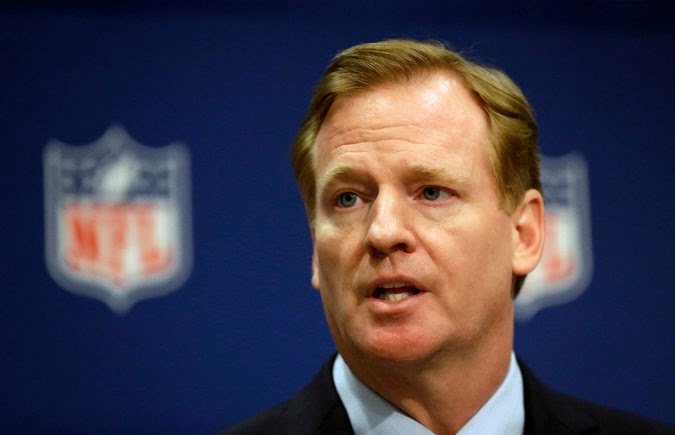 Goodell initially defended the decision to suspend Rice for two games. He said he spoke directly to Rice and noted that he avoided a trial by entering a counseling program. “He is a young man that really understands the mistake he made and he is out and about and determined to make a positive difference,” Goodell said at the beginning of August. But as blowback continued, he apparently recognized the issue was larger than just Rice. In his 2,000-word letter and memo, Goodell said that his decision was based as much on the obligation of the league to be held to a higher standard than other sports leagues and institutions. “Much of the criticism stemmed from a fundamental recognition that the N.F.L. is a leader, that we do stand for important values, and that we can project those values in ways that have a positive impact beyond professional football,” he wrote. Groups that criticized Goodell for being insensitive to the issue of domestic abuse applauded him for reversing course. “This decision by N.F.L. Commissioner Roger Goodell to change the league’s policy on how it disciplines players who beat their wives and girlfriends is a big win, not just for women, but for all N.F.L. players, staff and fans,” said Becky Bond, the political director of Credo, a women’s rights group. While other leagues employ an independent arbitrator to hear player appeals, the N.F.L. is essentially the judge and jury in disciplinary cases not covered by the collective bargaining agreement. This has led many commentators to compare Rice’s suspension over accusations that he assaulted his fiancée in an elevator to the four-game suspensions for players who violated the league’s drug policy. Still, Gordon’s penalty was based on guidelines agreed on between the league and the players union, not the commissioner. Goodell’s decision to more severely penalize those who commit domestic violence, on the other hand, has set a precedent.